I don't want to hijack this thread, but felt I had to mention something. I was out a few weeks ago flying my tattoo SUL during sunset. When it got dark to the point that I could still generally see the kite, something weird happened - my tricking just seemed to greatly improve. I don't know if it just seemed that way due to poorer visibility, but I like to think that by relying less on what I was seeing and more on what I was feeling on the lines - it just got lots smoother. 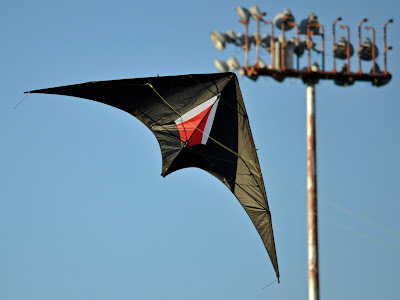 So, who knows, perhaps a darker kite can help get you more in tune with the flying "Force". 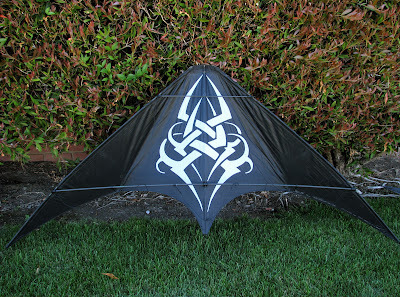 A splash of color on a black sail will really pop, a flourescent color will pop right off the kite. I like black and have used it as a main color, but never all black. I lose my purple fade widowmaker in the clouds though, so I see the points made on visibility. I lean more toward the Charcoal Gray color myself lately, even better backlit and colors still pop with it. All my Sea Devils are second-hand ... anyway one of them has the RED FLAMES coming out of the exhaust and is my favorite design ... to me this pilot has the perfect mind set on what this sport is all about ... no/yes? Allen's picture of the PBSK is one of the very few front-lit shots that shows the black as curved surfaces extremely well. 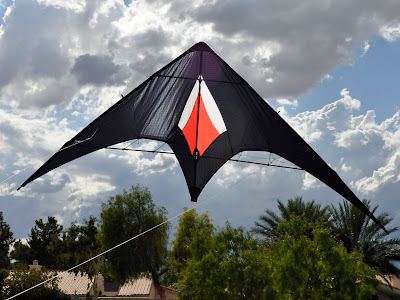 The hardest kite I've shot recently is a mostly black Ocius. When it was front lit, the black just lost almost all of its depth. And even backlit, it still loses depth in many areas. This one is fun. yes a real one. * yeah,and NO need for sarcasm by jay and to be a smarty pants,is there!!!!!!!!!!!!!!!!!!!!!!!!!!! !